When Tara (Gemma Arterton) is released from prison, she goes to see Renée (Adèle Haenel). Renée works as a school teacher and is trying to have a baby with her boyfriend (Jalil Lespert), but it appears that her past was rather different: Tara demands money from her, money they stole together before she was arrested, at a time when Tara worked with Sandra (Adèle Exarchopoulos). But how does Renée’s life tie in with Sandra or teenager Karine (Solène Rigot) who behaves much more maturely than she is or the small Kiki (Vega Cuzytek) who loves to play outside, even at the dangerous junkyard. Orphan really impressed me (and was the first of the Scope100 films that year that actually did). It’s a well-made film with fascinating female characters. The film introduces its four protagonists (plus Tara) in stories that interlock slightly and have some connection, but it isn’t until things have gone on for a while that I realized that all four of them are actually the same woman, only at different points in her life. I quite liked that turn of events as it ties the separate stories together better than any other far-fetched connection could have done, although I liked the separate stories on their own as well. Each of the renditions of Karine has her own strengths and each of the actresses portraying them are strong and fascinating in their own way, delivering good performances that work together as much as they stand on their own. And the addition of Gemma Arterton to any movie is a good thing, especially when she gets to make out with the bisexual female protagonist. Those make-out scenes were even surprisingly little male-gazey. It’s a slow-moving film, an effect that is only strengthened by the fact that it takes so long until the penny drops and connects the four stories with each other. It is also a very sad film and sometimes it’s very hard to bear. But those moments always come at the right time: when things are unbearable for the protagonist as well. 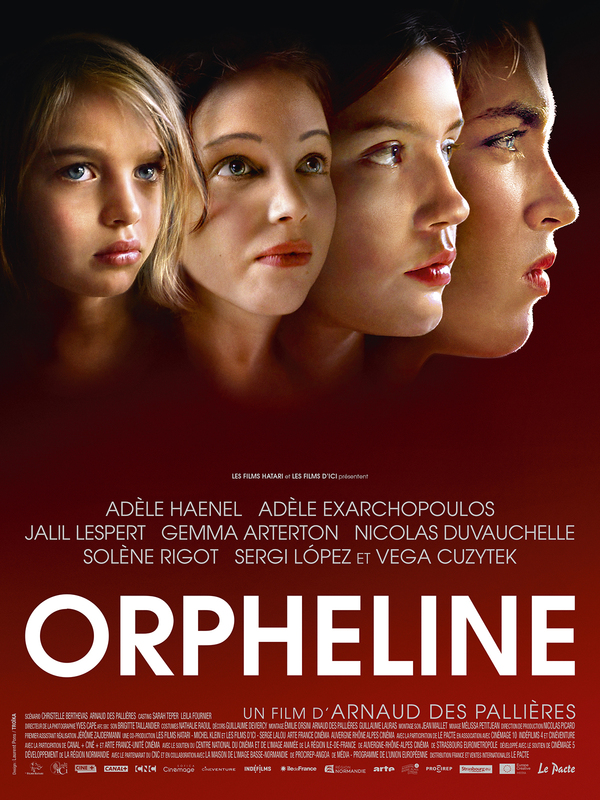 Rounded off with a beautiful soundtrack, Orpheline is a film that leaves a lasting impression and delivers a complex portrayal about a complex woman that leaves as much unsaid as it makes obvious. Simply beautiful. This entry was posted in female writer, movies and tagged 2016, Adèle Exarchopoulos, Adèle Haenel, Arnaud des Pallières, Christelle Berthevas, Gemma Arterton, Jalil Lespert, Karim Leklou, Nicolas Duvauchelle, Orphan, Orpheline, Robert Hunger-Bühler, Scope100, Sergi López, Solène Rigot, Vega Cuzytek by kalafudra. Bookmark the permalink.